Mariel Abreu and her newborn daughter Luna Jay, on baby’s first field trip, Miami, FL, January 2018. Photo by Jennifer Rycenga. You know your birding guide is top flight when she can spot a Mangrove Cuckoo while wearing her daughter in a baby carrier! 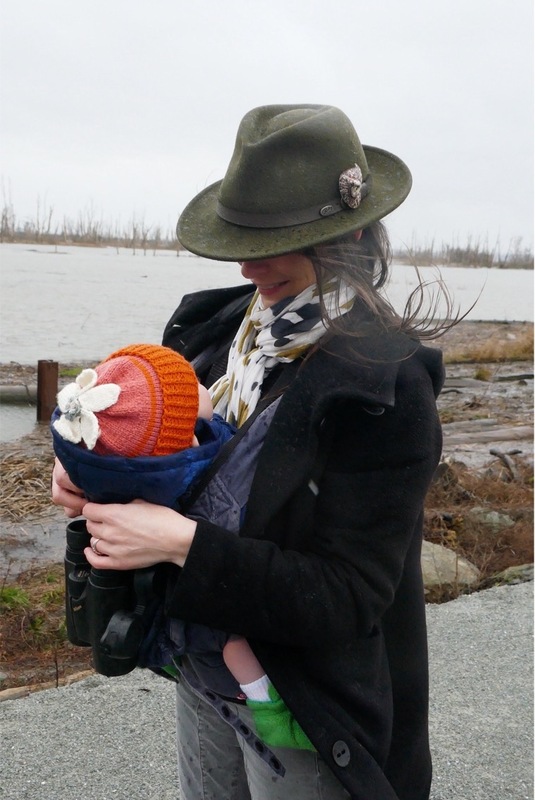 Who is this dynamic, wild bird loving professional, who is also raising a next generation birder? Mariel Abreu is co-owner, with her husband Angel Abreu, of Nature is Awesome birding and nature tours in Southern Florida. The Abreus are beloved guides in the North American birding scene, making a name for their company as experts for Southern Florida since 2011, and more recently, specially curated birding trips to Cuba. Mariel came to my attention for her youth (she’s 39) and that she was guiding as a new parent. She also emphasizes her feminine touch in tour planning on their website, and this bit of marketing intrigued me. What might a woman-owned tour company offer clients that is different? 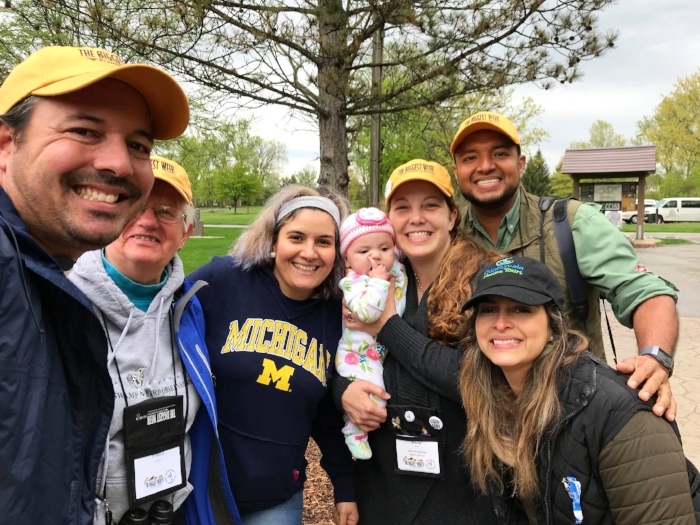 I approached her through Facebook as she was preparing to drive with her husband and their baby, Luna Jay, to the 2018 Biggest Week in Birding event in Ohio last April. We spoke through various media channels over the summer of 2018 and below are the highlights of our conversation. Leading a Spanish Walk with Luna Jay for Adelante, The Latino Resource Center during Biggest Week, Ohio, 2018. Photo by Angel Abreu. How did you start your guiding business? Mariel Abreu: Before Nature is Awesome Tours became a reality, I helped friends and acquaintances pursue South Florida’s specialty bird species, as a favor or show of friendship. But with time, I began to field inquiries from birders and nature enthusiasts, looking for a guide in the Miami area. Eventually these inquires became more frequent, and began to interfere with my work schedule (as a park ranger). This is when I decided it was time to take a chance, so I resigned from my job opened a guide service business. I’ve always been a nature enthusiast, even though no one in my family is in the sciences. My husband and I both grew up in Miami and got into birding through recreational fishing when we noticed all these gulls chasing our bait! When we turned to birding, we stopped fishing. We’re self-taught birders and learned together. Is being a female guide an advantage? How? MA: Yes, I believe there are advantages to being a female guide that benefit clients. I do a lot of scouting and combine cultural breaks with the birding stops. I bring healthy, organic snacks, feminine hygiene products, sunscreen and non chemical bug spray. I want female clients to know that I have taken their needs into consideration, and pay attention to details such as periodic clean and safe bathroom breaks along the route and responsible first-rate dining establishments. I try my best to choose dining establishments that are owned/operated by women. I prefer to help local family establishments over anything commercially owned. I learned from guiding earlier both as a ranger and for friends that proper bathrooms are important, and many birders are older and need to stop more often. I bake homemade snacks for clients whenever possible. Clients give feedback about how much they loved this. They like the wholesome and homemade feeling I bring to the tour. I also find that female clients often feel more comfortable trusting and hiring a female guide that they've never met, over a male guide they’ve never met. Abreu providing shade on a hot day for client Becky while looking at Roseate Tern in Florida Keys, Summer 2017. Photo by Denise Bittle. Does being a female guide have disadvantages? What are they? MA: One notorious disadvantage for a female guide is the unfortunate incidence at which your expertise and knowledge will be questioned, both by male, and female birders alike. I’ve seen this time and time again, and have dealt with this first hand on many occasions. 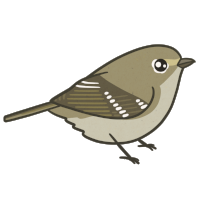 e.g., a female birder/guide is asked for an identification, only for the question to be passed along to the nearest male, even though the female guide has already given the correct identification. I’ve had participants ask a random male in the group when I am clearly the guide, like they need a man to reaffirm it. Women are taught to question another woman’s knowledge and I’ve had it happen with women too. You have to take it in stride. Miami, FL. Photo by Angel Abreu. How has having a child impacted your business? Do you bring your child with you and what do clients think? Having a child has definitely impacted my business. At first having a child put me on the sidelines as I recovered from delivery. But luckily our daughter was born with my inquisitive and explorer genes. She enjoys being outdoors and has already been on her first day tours with repeat clients. I also meet my husband while he is out in the field. Meeting the group on location, allows to me to step away from the tour if need be, but also allows me to continue to guide and expose clients to our family style of guiding. Normally it’s a real treat for everyone involved. When I do this, I carry our daughter in a carrier that allows me to have my hands free, so that I can work with my binoculars. It really does not slow me down a whole bunch, and I believe clients really enjoy seeing our family unit out guiding together. Birding Magee Marsh Boardwalk with Luna Jay at Biggest Week, Ohio, 2018. Photo by Angel Abreu. Tell me about your birding trips to Cuba, they sound wonderful! MA: My husband and I are both of Cuban descent, first generation. Our first trip to Cuba with clients was in March 2016, and very emotional for us. We have family there and know the culture. We purposely make arrangements outside the Cuban government to stay in mom and pop places, hire local guides, supporting Cubans on the ground, so that clients are immersed in the culture. 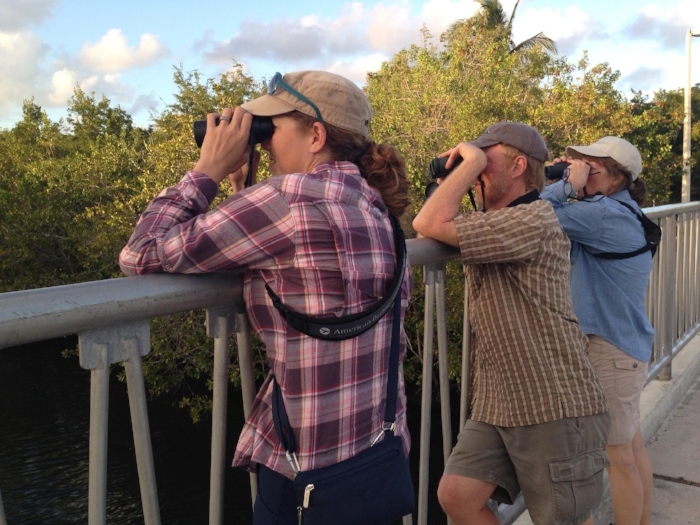 We hire local expertise like Tania Piñeiro Cordero, Cuba’s premiere female birding guide. She leads her own groups and brings her charisma and vast knowledge of 20 years working for Ciénaga de Zapata Wetlands (Cuba’s version of the Everglades NP similar habitat). She was the only woman guide when we started going in 2016. Now other women are being trained and also guiding, like her daughter. 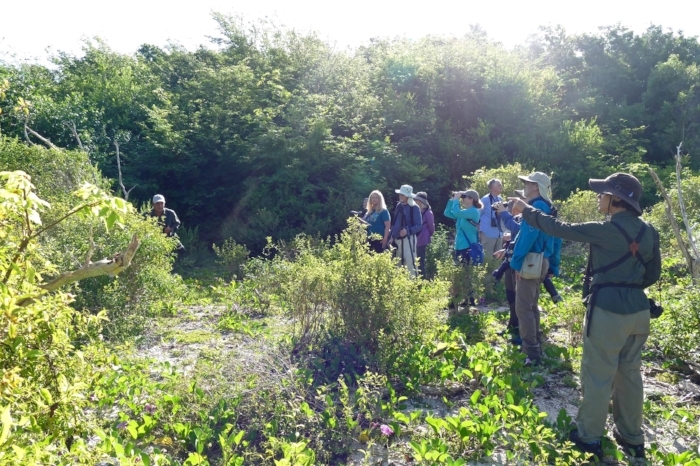 Nature is Awesome group looking at Bee Hummingbird (world’s smallest bird) in Guanahacabibes, Cuba. Tania (one of NIA’s female Cuban guides) is in the forefront of this photo. Mariel Abreu is in the center. Photo by Angel Abreu. 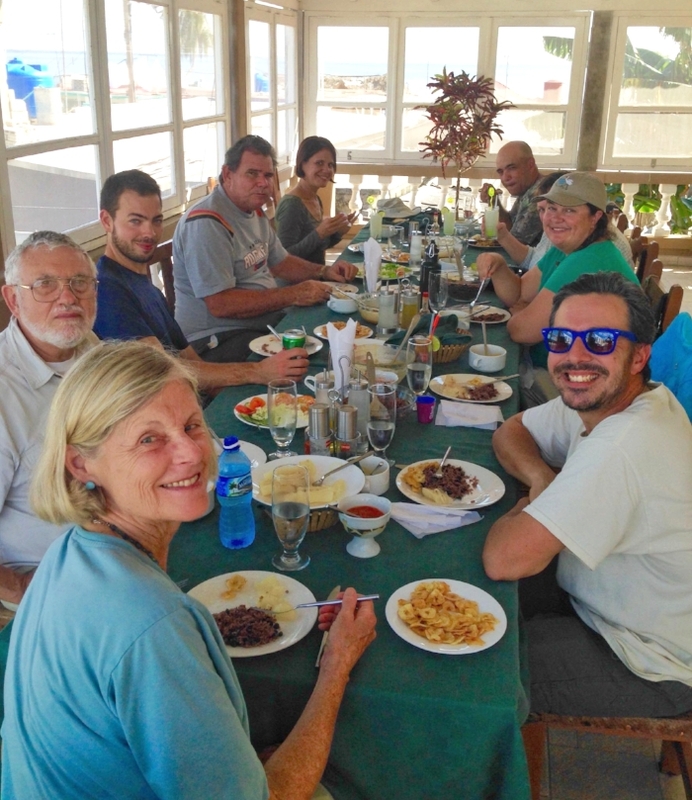 Cuban family-style meal in Playa Larga, Cuba. Photo by Mariel Abreu. American Flamingo, Cuba. Photo by Angel Abreu. Collared Aracari, Panama. Photo by Angel Abreu. What’s coming up for your company? MA: In recent years, I’ve started to see an uptick in the number of families that hire my guide service for a family tour. I now generally lead a handful of these tours a year, but only see this segment of birding and eco-tourism to be on the rise. Families are looking for a guide that has the expertise to organize and lead a safe, fun and informative tour, all while being able to connect to the kids, keeping them engaged, and interested in what they are seeing and learning about. This has inspired me to develop more family adventure packages, that cater to families as a whole. Tour packages that are more inclusive and allow parents to continue to go birding while traveling, but at a pace that the entire family can enjoy. So while kids for some birders may be seen as a setback, I see it as a new possibility to enjoy birds and nature experiences as a family unit. I’m really looking forward to being a part of more family trips! If you would like to learn more about Mariel and Angel Abreu’s tours, visit their website Nature is Awesome.